“Pacific Service Credit Union is a proud supporter of the Food Bank of Contra Costa and Solano. It is part of our mission to be a good corporate citizen and assist the communities we serve. We support the Food Bank because 1 in 8 of our neighbors depend on them to receive emergency and supplemental food. We value our partnership with the Food Bank and have found many creative ways to donate time and money. One of our favorites is our annual three-month long ‘Jeans for Beans’ campaign. Employees are encouraged to “buy” punch cards by donating food, which allows them to wear jeans any day of the week. We also place collection barrels in our corporate office and branches during the holidays. Typically, we collect more than 500 pounds of food to assist families in need. Along with corporate donations, we contribute approximately $37,000 annually to the Food Bank. For information on team building and Corporate sponsorship opportunities, contact John Calender – [email protected] or call 925.771.1313. April is Volunteer Appreciation Month! We’re celebrating with a few stories submitted by regular volunteers. Tell us why you volunteer in the comments. Take it away, Renee! “I retired from work two years ago and I knew I wanted to do something to help people. I never had the time to volunteer while I was working full time and raising my two sons. I started searching the wonderful web to see what opportunities were out there. I came across the Food Bank of Contra Costa and Solano and signed up. I primarily help distribute the fresh produce at various sites throughout Fairfield and Vacaville. It so good to see the wonderful produce we hand out and to see how grateful people are to get produce. It gives me a chance to interact with people and I love working outside. I have also really enjoyed working with Elaine who drives the food truck. To find a volunteer role that suits you, visit www.foodbankccs.org/volunteer. Roger Hancock has been a long-time friend of the Food Bank as a regular volunteer and donor. Ten years ago he brought along a team of CSAA Insurance Group volunteers and the rest is history. Now he helps organize numerous events throughout the year for employees to volunteer at the Food Bank. New hires at CSAA Insurance Group headquarters in Walnut Creek also participate in a volunteer event at the Food Bank as part of their on-boarding process. What was your first impression of the Food Bank? Amazing facility and truly amazing staff and volunteers. It is extraordinary what the Food Bank accomplishes on a daily basis to serve hunger in our community. I was most impressed that Larry Sly, Executive Director of the Food Bank, stopped by to thank the volunteers for the important work that they do. Larry continues to find time in his day to swing by to thank the food sorting volunteers. Incredible, personal touch. When you last volunteered, how did that make you feel? I always have a rewarding, meaningful, and fun time at the Food Bank. Our employees at CSAA Insurance Group also report feeling fulfilled and enjoying spending time with their colleagues. And, I also like that I can volunteer alongside of my wife, Sunny. I also like the “physical workout.” I usually volunteer to lift, tape, and weigh boxes that are about 30 – 40 pounds. Volunteering at the Food Bank truly is rewarding and an excellent place for our employees to volunteer in teams. The time commitment to successfully complete a volunteer shift is very manageable – lasting 2 – 3 hours. I leave the Food Bank pretty exhausted. But, I feel great at what our team of volunteers accomplishes. Do it. Volunteer. When I go to the Food Bank — I arrive happy and excited. When I am at the Food Bank, I am working hard and having fun. And, when I leave the Food Bank, I know I have made a difference in the lives of others… and in my own life too. Thanks for all you do Roger and team! The post below written by Executive Director Larry Sly was originally posted in 2015 and is as relevant today as it was then. We are happy to report that three years later we now have over 106,000 volunteer hours donated to us a year. Even with that, many shifts in our Fairfield warehouse go unfilled. With a variety of ways to volunteer, your unique skills can help us fight hunger. If you would like to honor Dr. King’s memory by volunteering, browse the calendar for volunteer opportunities to fit your schedule. When the Martin Luther King Jr. holiday was declared I don’t think people realized it would evolve into a day that is focused on volunteer service. It’s very appropriate the day has become dedicated to community service, as it highlights the role giving back plays as part of American life. For those of us old enough to remember, when the federal holiday was declared many states and localities did not observe the day. Recent events demonstrate that the struggles of the civil rights era are still not resolved and when the Martin Luther King Jr. holiday was enacted by the federal government, there was resistance to honoring the day. But as time has passed, the holiday has become more universally observed, and that is because the holiday honors the work Martin Luther King Jr. did to help make a better community. Today many people celebrate the holiday by participating in a volunteer activity that helps make a stronger community. Volunteering is an American tradition that goes back generations. It is a tradition that when people identify a problem they come together to try to help. Service clubs like Rotary, Kiwanis, Soroptomists or Lions clubs exist so members can act as volunteers to make a stronger community. Faith communities often have a social mission committee that focuses on the role they should play in dealing with community issues. Non-profit organizations have a distinct role in our society because we realize there are some things that are done better by organizations that effectively use volunteers in their work. The Food Bank of Contra Costa and Solano depends on volunteers. We have more than 88,000 hours of volunteer time given to us each year. That includes people answering our phones, sorting the food donations we receive and helping with the food distributions we do in the community. Our Board of Directors are all volunteers, the people who help us prepare thank you letters for donors are volunteers, and the people who help bag produce for distribution are volunteers. We depend on people being willing to give their time and talent in order to make our work possible. Like every other non-profit organization in our community, we need your help. Whether you want to help the Food Bank, a homeless shelter or an education program at your local school, the Martin Luther King Jr. holiday is an excellent reminder of how much your help is needed. Dr. King’s “I Have a Dream” speech is one of the most moving statements ever made about the society we hope we will all see one day. Everyone should be judged on the content of their character, not the color of their skin or any other factor. By volunteering and giving back to our society, we help move ourselves closer to that goal. When we give, we enrich ourselves because we understand the problems others face and what we can do to make a difference. When we give back, we honor Dr. King’s memory. When the world’s problems seem to be overwhelming, that’s the first question many of us ask ourselves. The answer is GET INVOLVED. There are countless worthwhile organizations that are looking for people who are willing to help others in need. The Food Bank of Contra Costa and Solano is no exception. Along with our financial donors, the Food Bank relies heavily on volunteers. In fact, committed people gave over 96,000 hours of their precious time to help ensure hungry people in our community had access to food last year. That’s the equivalent of 46 full-time employees! We would not be able to distribute the more than 20 million pounds of food a year and have 96 cents for every dollar go directly towards food programs if it weren’t for these coveted everyday heroes. If you haven’t volunteered before and you are wondering what you’ll get out of it, all you need to do is do an Internet search on “benefits of volunteering.” You’ll learn that you’ll actually end up getting more than you give. Improving your mental and physical health, developing new skills, and creating new friendships are just some of the documented perks that come with philanthropic efforts. These volunteers all have something in common. One day they all decided to try something new. They opened themselves to a new experience that would help make our community a better place. We encourage you to do the same. There are many ways for both adults and children to get involved at the Food Bank. Giving as little as two hours of your time can help change the world. To learn more, visit www.foodbankccs.org. On Sunday, October 30th, the Food Bank hosted well over 250 volunteers for a Volunteer Recognition Lunch at our Concord warehouse to celebrate their contributions towards ending hunger. This past year, our wonderful volunteers donated over 96,000 hours of their time in a myriad of ways! Sharon Zeppegno, Volunteer Services Manager, described it as the highest turnout yet. Their Sunday afternoon was spent socializing, enjoying a catered lunch, and being recognized for their generous contributions. From everyone at the Food Bank, thank you for sharing time and gifts as we work together to end hunger. Check out all the pictures from the event on our Facebook page. The single-file line began forming at least 30 minutes before the event was to start. There were men and women, old and young, tall and short. There were mothers pushing strollers, pre-schoolers hanging on to parents’ hands and seniors leaning on walkers and canes. They were white, black, Hispanic, Asian, all united in a purpose this day: They came to fill their bags with 20 pounds of fruits and vegetables delivered by refrigerated truck and then piled high on folding tables on a San Pablo parking lot. The Community Produce Program, which services neighborhoods far and wide, is only one of many ways that the Food Bank of Contra Costa and Solano helps put dinner on the tables of disadvantaged families. But until you see the operation in action, until you see the smiling faces and the twinkling eyes, you can’t appreciate what this program means to families struggling to get by. On this day, a simmering Friday in September, about 200 participants — most indicating they had three or more dependents at home — patiently waited their turns to check in with a volunteer and fill their bags with three-pound portions of potatoes, onions, carrots, oranges, pears and apples. All waiting lines should be so orderly. The truck’s twice monthly visits are keenly anticipated and its schedule well known, thanks to word-of-mouth communication by appreciative participants. Every visit is an important visit, of course, but some leave special memories behind. On this occasion, it came from a youngster about 4 years old, who quietly followed his mother from station to station, boredom on his face, until he saw what awaited him on a table near the end. “Wow,” he said. “Apples!” His eyes lit up. It was a moment that reminds you why the Food Bank is so important. Big Thanks to Rancho Solano! Thanks to the generous residents and helpful volunteers of Rancho Solano for holding their 16th Annual Food Drive, Thanksgiving in June. They collected 2,351 pounds of food for the Food Bank! We are especially appreciative for the generous donation, since food donations tend to decrease down during the summer months. Originally posted in the Vacaville Reporter: The Food Bank of Contra Costa and Solano is facing a critical shortage of volunteers at our Fairfield warehouse. Though our Concord warehouse has an abundance of individuals, families and corporate groups willing to donate their time, it’s an ongoing challenge to meet the demands in our warehouse on the other side of the Benicia Bridge. In fact, in the past three months, only 25 percent of the available shifts in Fairfield were filled to capacity. The need is great because most of our produce preparation occurs in our Fairfield facility. We take pride in that over half of the food we distribute consists of fresh produce. In order to get the fruit and vegetables out to our community members in need (from children to seniors), it needs to be sorted and bagged first. If you’ve never helped out in our sorting room, you might be wondering what’s involved. It’s quite simple and all shifts only require a two or three hour time commitment. The Food Bank receives produce in vast cardboard bins. Volunteers move the produce from the large bins to smaller, more manageable, containers such as bags and boxes that are light enough to carry. During the process, produce is inspected and any produce that isn’t edible is removed. Because we have over 90,000 hours of volunteer time gifted to us each year between the two warehouses, we have a computerized volunteer management system. It’s easy to look up available opportunities in Fairfield and register to be a volunteer by going to our website at www.foodbankccs.org/volunteer. We make it convenient to volunteer by offering day shifts Monday through Saturday and shifts in the early evening on Tuesdays, Wednesdays and Thursdays. If you have children, we encourage you to introduce them to the rewarding experience of helping others. Children as young as 11 years old can volunteer when accompanied by an adult. The Food Bank is conveniently located near the Jelly Belly factory, so you can turn the day into a fun summer excursion. If you have younger children, we encourage you to sign up for the next Family Food Sort on Saturday, July 16, from 9:00 to 11 a.m. At the monthly Family Food Sort event, the minimum age requirement for volunteering is lowered to 5 years old when accompanied by an adult. Volunteering is a rewarding experience for people of all ages. We feel better about ourselves and our community when we are giving to something bigger. Encourage your friends and organizations to join you. The relationships we build when we work together with people from service clubs or faith communities makes us all feel part of a significant change. It would not be possible for the Food Bank to provide food to people in need if we did not have dedicated supporters willing to offer hands-on help. Although sorting produce is definitely our greatest need right now, you can look at our website for other ways that you can assist. We urge you to join us in making our community better by signing up to be a volunteer today. 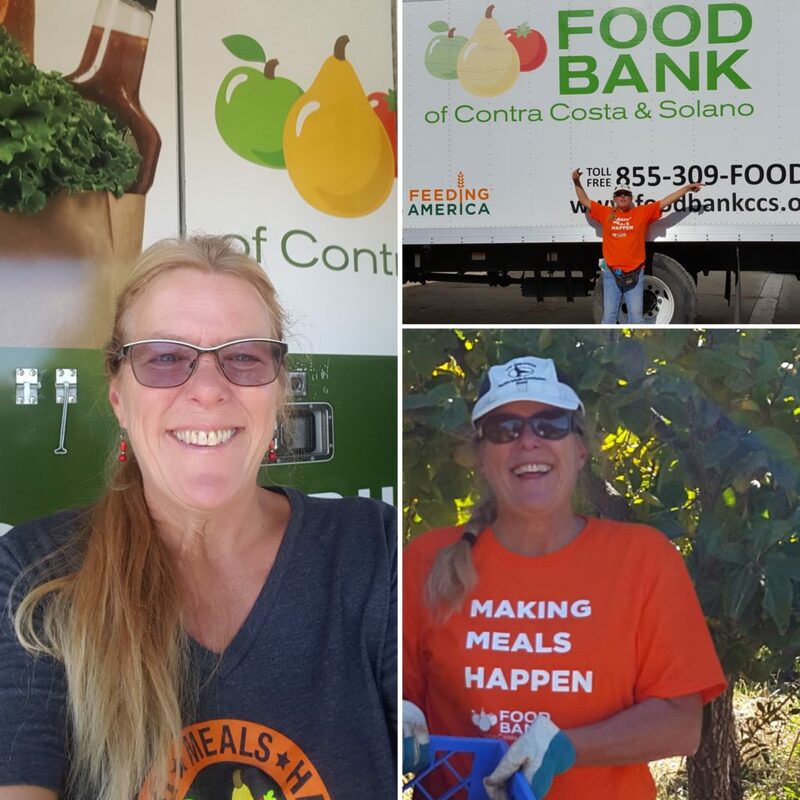 Originally posted on the Vacaville Reporter: It is common to dread turning forty, but we at the Food Bank of Contra Costa and Solano are proud of what we have accomplished as we turn the big 4-0. Today marks the 40th anniversary that our incorporation documents were filed. To honor our 40th birthday, generous donors came together to make up the Friends of the Fortieth Fund. They contributed $40,000 to be used as a matching fund for other donors. In short, if community members rally together to contribute $40,000, we will actually receive $80,000 because of the dollar-for-dollar match. What does this mean to the food-insecure people we serve? Since we are able to provide two meals for every dollar we receive, your donations (along with the matching funds) will allow us to provide 160,000 meals to children and seniors in our community. The concept of a local food bank started with a borrowed Safeway trailer, parked in a church parking lot, and two employees who had access to trucks. When people applying for government assistance programs ran into delays, eligibility workers would refer them to these pantries to obtain emergency food. At the beginning, we were providing food to 19 emergency food pantries. We now serve almost 200 pantries and 1 in 8 residents. We are no longer an agency exclusively providing short-term assistance. We still support pantries that assist people on an emergency basis, but we also are an essential part of the ongoing community response to hunger. We have developed specific programs that give food to low-income seniors and low-income children. We also make available donated food from the US Department of Agriculture to low-income people in Solano and Contra Costa counties. Our Community Produce Program provides fresh fruit and vegetables at clinics, churches and schools in low-income neighborhoods. We are part of a network that food-insecure people use to help provide for their families. Our ongoing job is to continue providing food to people in need, while working to end hunger. What are some of the things we do to end hunger? We partner with governmental, philanthropic and other community-based programs to try to increase participation in the CalFresh program. We are working to help more children benefit from the School Lunch Program and Summer Meal Program. We engage the community and advocate at the Capitol so we can help everyone obtain the good nutrition they need to thrive. Our founders knew that saving food from waste was a good idea. The same principle guides us today, as we see what food donations are available and determine how best to use them to meet the needs of the people we serve. However, food donations alone don’t cover the need within our community. We need to also purchase food in order to meet the demand. And you guessed it, purchasing food takes money. If you are interested in making a donation to the Food Bank in honor of our 40th anniversary of serving the community, you can do so at www.foodbankccs.org/40for40. We humbly thank our community members for your continued support during the past forty years. Originally posted on the Vacaville Reporter: When I was a child (a long time ago), the newspaper had a little box listing the number of days until Christmas. Maybe it was an advertisement paid for by retailers, but it certainly made me count down to the ultimate holiday. As an adult, it is amazing how fast the holidays sneak up on us. With that said, we are officially more than halfway to the 2015 holiday season. Different wintertime holidays provide opportunities for introspection and celebration to honor important cultural events. The holidays are a time when people are most likely to take action in making a difference in their community. Generous people provide the Food Bank of Contra Costa and Solano with food donations, financial donations and volunteer hours. If you looked at a graph of the Food Bank’s support month by month in all three areas, you’d see the enormous peaks in November and December. The challenge for the Food Bank is that the people we serve are hungry every day. We assist food-insecure people all year long. We stretch the food we receive during the holidays as far as we are able. However, we end up purchasing more food during the summer to offset the decline in food donations and food drives. The National Association of Letter Carriers helps us out by conducting a large-scale food drive in the spring. We need this enthusiasm for hosting food drives year round from both big organizations and individuals wanting to make a difference. Whether you want to host a food drive or drop nonperishable food off at an existing one, visit us at www.foodbankccs.org/fooddrive for more information. There often is a spike in financial donations during the holidays from both corporations and individuals. People want their neighbors to all have a good holiday meal. To help people receive proper nourishment all year long, we make it easy to donate on a monthly basis. To find out more about becoming a pledge donor, visit www.foodbankccs.org/donate. Even though we expand our volunteer opportunities during the holidays, we often have to limit the number of groups we can safely accommodate because of the increased interest in volunteering. During the summer, we have more perishable fresh produce available to us than anytime of the year, so we need volunteers to help sort it in a timely manner. In fact, an opportunity is coming up on Saturday, July 18, for families with young children, ages 5 and older, to volunteer. Our Fairfield warehouse is hosting its monthly Family Food Sort. Details and registration information are available at www.foodbanksccs.org/familyfoodsort. The holiday season is a time for us to come together as families and as a unified community. I often wish that the holiday spirit, especially the desire to help others, were with us throughout the year. The need to feed people in our community does not go away after the holidays. Why wait until November to take action? When people show the holiday spirit all year long, the gift they give is a strong and healthy community. In an effort to limit their children’s time in front of electronic devices, many parents come up with lists of things their children can do over summer. The Food Bank of Contra Costa and Solano has got some ideas to add to that list. In July the Food Bank will host two special events that allow young children to volunteer. On July 18, in our Fairfield warehouse, we will host our monthly Family Food Sort. Family Food Sorts are volunteer opportunities designated for families with young children. They occur on the third Saturday of every month. Families work together to bag produce that will be distributed through our Community Produce Program. The children attending will learn that the food that they are sorting will be given to people who don’t have enough to eat. On July 19, at our Concord warehouse, we will host our (not quite) quarterly Family Volunteer Day. This is a popular event that also allows parents or grandparents to introduce their young children to volunteerism. The children work side-by-side with their family members to do a fun sorting project. They get to experience the joy of helping others in need firsthand. Families also get to go on a guided tour of the warehouse. What makes these events unique is that the food bank’s normal minimum age requirement is 11 years old. With both Family Volunteer Days and Family Food Sorts, we welcome children as young as 5 years old to attend. Shifts fill up quickly; to reserve a shift at either function, visit www.facebookccs.org/events. If your family can’t make these upcoming events, there are other ways that your child can help the Food Bank on their own time. If your child likes to cook, encourage them to host a bake sale or lemonade stand. If your child is crafty, suggest that they sell their creations to others. They will get a taste of what is involved in running a business and they can opt to donate all or a portion of the proceeds to the Food Bank. In honor of our 40th anniversary, their financial donations can be matched dollar-for-dollar. Visit www.foodbankccs.org/40th for more information. Another way children can help the Food Bank is by holding a traditional food drive. Your child can coordinate a food drive in conjunction with your annual block party, a Fourth of July gathering or any kind of function this summer. They can make flyers and notify friends, family and neighbors that they are collecting food on behalf of the Food Bank. Whether your child collects food or funds, they will receive a thank you letter from the food bank for their efforts and donation. More information about holding a food drive can be found at www.foodbankccs.org/fooddrive. This is the time of year when donation levels at the Food Bank drop considerably. Having children think of people in need and encouraging them to take action can simultaneously alleviate their boredom and stock our shelves. It’s one thing to tell children about people who are less fortunate. It’s another thing to actually empower them to do something about it. When children start to do volunteer work, they become vested in their community and realize that they can make a difference, no matter their age.